Colin Foxton, Paul Swainston, Nigel Hall, Brian Orange and the JVs. On arrival the left valve rod was spotted forlornly leaning up against the wall next to the press in the running shed with the last piece of the head and broken key still firmly in place. So back to deviation shed. 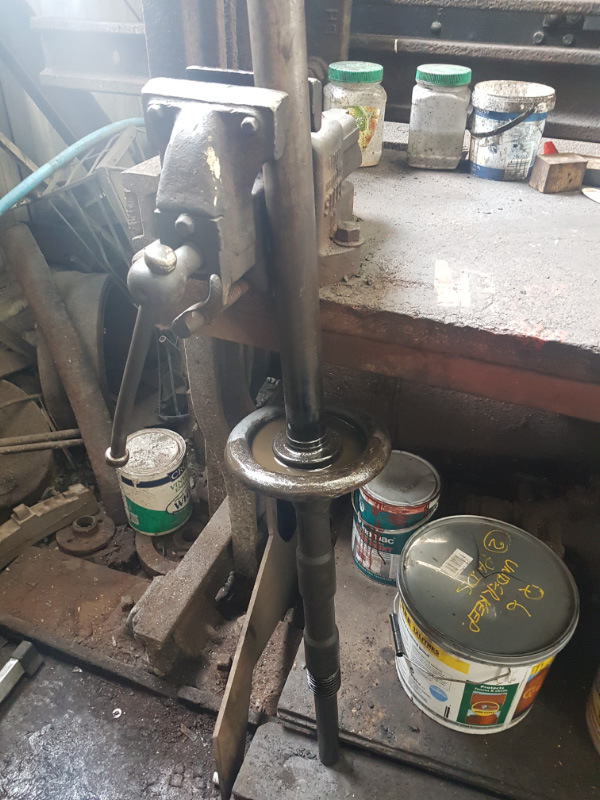 The rest of the elements of the left valve rod had their mating faces thoroughly cleaned with help from Paul Swainston at the end of his NYMR cleaning shift. A trial assembly of all the elements on to the rod was tried and a similar problem experienced to the right hand rod where once the nut was fully tightened both valve rings were solid. So whether or not the elusive key is removed this issue of the rings not being free on both valves will have to be examined further. Time to go home after varying attempts with penetrating oil, paraffin and gentle persuasion, you guessed it, no movement so the rod was left in the vice outside the workshop with the outside of the head uppermost and the well full of paraffin. Hopefully by next Wednesday or Saturday the situation may have eased. In the running shed we continued with the cleaning of the RHS frames, assisted from time to time by Bryan and a succession of JVs. By the end of the day we had them free enough of grease to make the first pass with the orbital sander. Hopefully the LHS is in a fit condition for the orbital sander on Wednesday too. The rain lashed down. All that was needed was the swarm of midges for it to be an August day in Ft William. Neal Woods (driving) and Bill Dobson visited us during the day.